It’s the Wai that I live! Gretchyn and Sunshine(the Uke) are off to Peru to volunteer. Ven Conmigo! Sa wat di khaaaa! Included with this greeting would be a fun little motion called a wai. The wai consists of bringing your hands together in prayer position(oops my yoga teacher is showing again) and bending slightly at the waist, Bowing your head. Depending on your age or social rank the wai will be more pronounced, longer, more bending. Yesterday I was sittin on my porch and my neighbors two year old toddled up my steps to watch me play uke, and there was nothing more precious than the wai he gave me. Except for maybe the cheezball grin he offered when I let him strum on my uke. If you thinks it cute to have a kid wave at you, you should see one wai! I often forget the wai and catch myself trying to wave at people. It works for my students, they embrace my customs! They love to shake my hand, high five and hug! Which I love because as I mentioned I have been a little short on my hug supply since arriving in Thailand! The wai is becoming second nature now, what can I say? It’s the wai that I live! 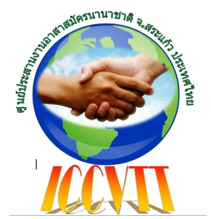 In case any of you were wondering how I came to teach at this wonderful school in Thailand, I was placed here by a wonderful organization: ICCVTT, international center for coordinating volunteer teachers, Thailand. Here’s the best part, it’s FREE! I knew I wanted to commit a significant portion of my time in Thailand to being of service. When I started searching for opportunities I was shocked at what I found: hundreds of ” voluntourism” sites charging upwards of 1500 dollars to participate in a volunteer project. Seriously the most expensive one I found charged close to five g’s for a two week program. In the words of my father: That’s OBSCENE! One day I stumbled upon an appropriately named website: freevolunteerthailand.org. After finding so many sites that wanted to charge money, I was a bit concerned that they were some sort of scam. I researched the site a bit and they seemed legitimate so I applied. I was accepted in late November and I was ecstatic, though much of the information still remained up in the air. They are a small organization, and organize a host of wonderful causes. I am so happy to have found this organization because it has provided for me just the experience I was looking for. The only fee that I paid was a twenty dollar application fee and my travel expenses. The school provides my housing, and two meals a day during the week. They were always happy and quick to answer my questions and placed me in such a great school! I love Anuban Tapraya! They were very caring about making sure that I arrived to my school and that I was picked up an taken care of. ICCVTT has just started a new project , besides coordinating volunteers, and running their own school! The new project is called Thai friends: compassion without borders. Their aim is to provide free English lessons to the impoverished Cambodians living in camps inside Thailand. Perhaps I sent you a Facebook invite to like their page? Please go to the freevolunteerthailand.org website and check in to ther new project. They are in serious need for funding and so little helps so much. You can sponsor a cambodian student with a recurring donation of just FIVE dollars a month! Five dollars a month! Will help a child receive school supplies adequate clothing and English lessons! You can also send a one time donation in any denomination. I don’t often like to donate to things because it’s hard to follow the money trail and know I it’s really going to be put to good use by the organization. I can wholeheartedly say that the organizers are genuine about their cause. If they were In it for the money they could easily Be charging thousands for their volunteer experience. Okay please if you can donate something, infomercial over! I love you! On to tales of life! I just finished another marvelous day at school! It concluded with a dance session with my new entourage: Mud ( formerly I thought her name was mat), Game, Beem, Fern, and daang mo( means watermelon). And of course a photo session mixed with English lesson, these gals surely love to take pictures! There enthusiasm and giggly liveliness is such a pleasure to be around and it’s fun to practice our English and Thai together! I taught two level four classes today and one level six, they did poorly on their exams and I just helped with pronunciation as they reviewed their errors. I think all the teachers are conspiring to make me fat! They brought so many treats today, and thse crazy donuts, one was stuffed with sweet fried coconut, what I need inside of a donut is sweetened fried coconut! Ooh it’s a codonut! Ha ! The other variety had a thick sugar glaze and was filled with a salty garlic soybean paste, that was weird! They also brought sweet breaded and fried banana and sweet potato, funny little cupcakes, and the usual delicious lunch! My oh my! I thought I would get skinny in Thailand eating veggies and rice noodles! holland, but has been living here for years. He was an architect an has built his own home here. He has also rebuilt the shop we are in front of for his girlfriend. It’s a cozy little massage business with three short Thai massage tables decorated in cute Thai patterned linens. We had a talk about his five children, and his wife and son that had both died of cancer. We talked about death and the feelings of helplessness, sorrow, anger, and everything that comes along with it. Which also led us to talking about how you can’t stay in that despair, you have to leave the grief eventually. It was a personal and connective first meeting. I enjoy first conversations that delve deeper than just the surface. He tells me his oldest son is fifty eight, and I ask if he was twelve when he had him because he only looked seventy at the least! He’s seventy eight! Well living the good life in Thailand has done wondrs for him. This led us into the topic of age just being a number and it’s all about how you feel on the inside, agreed, I’m still twelve years old. After watching his girlfriend massage a client I inquired as to how mug a massage is, one hour for two hundred baht! That’s about six dollars folks! I scheduled an appointment for the next day. I was glowing after the conversation! I walked to the supermarket and picked up some school supplies and snacks, then I casually drifted on to my Barbie dream house. Tuesday we had no classes because of midterm exams. Su and I started off for school as usual and took in our breakfast and prepared lesson plans. During lunch we played impromptu number games with the kids. Time flies just helping them spell and figure out the numbers. Su is an excellent teacher and the kids really flock to her. I left for my massage after lunch and was greeted by Arut. I met his girlfriend Raat officially and she set to work givin my first official Thai massage ever! Oh it was incredible! I studies thai massage a little bit, boy does she know her stuff! I was just like a little baby in her hands. I felt guilty that it only cost six dollars, but Thailand is not a tipping culture. Though when I go back I will probably tip her! Wednesday were midterm exams also, so another free day! Su and I made more games to play with the students during lunch. I broke out the yellow ukelele and played the abc song for the kindy kids. The older levels came around and we played games with them. I made a bunch of stickers to give away a prizes. The hour just flew by playing wih the kids. One boy knew how to play ukelele and he was very good! I found out that Kru Kung also has a ukelele, she brought it out and I tuned it up and taught her a few chords! I teach yoga, English and ukelele! The kids passed the uke around and tried it out, I so enjoy watching all of those smiles! We stayed all day at school and plate more games with my entourage of level five students. I walked home, bought more pineapple and then took a bike ride. Exploring new directions i turned down random roads the sides powdered with mars red dust. I saw big a big oxette with a little one at her teets. I saw men wade in ponds fishing. I found really beautiful Thai style cabins in the middle of nowhere, I pedaled down a road that followed a pond back into the middle of nowhere and into a dusty road until I found myself back in civilization. I had a pleasant biking experience and hope I burned up some of the donuts that I put in today! Thanks for tuning in again and I hope you will consider donating to compassion without borders if you can! Lovely love to you all!